Colchicum autumnale, the autumn crocus, the meadow saffron. I am neither a botanist, nor a taxonomist, so when something is called a crocus I naturally assume it is, well, a crocus. Silly me. They aren’t even in the same family, let alone order. They are both monocots, so they’ve got that going for them. Back to the autumn crocus. Like the name suggests, they bloom in the fall after their spring and summer foliage has died back. Though they prefer full sun, I’m thinking of planting them around my house in some part shade areas. I live in some brutal summer heat, so I think they would do OK. 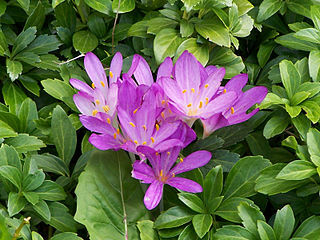 The other reason why I want to plant them has to do with squirrels and the genus name Colchicum. The autumn crocus is a source of colchicine, a secondary metabolite, and found in every part of the plant. It is a bitter tasting alkaloid, which is Nature’s way of saying “don’t eat me.” For centuries though, colchicine has been used to treat gout, an acute inflammatory arthritis afflicting (typically) the big toe. Probably for this reason, generic colchicine was used off-label to treat gout. [Interesting note: in the US any approved drug can be used for any reason (off-label), but manufacturers aren’t supposed to market it for anything other than what the FDA approved it for. Yeah, right.] In 2009 though, the FDA gave URL Pharma a three-year exclusivity to manufacture and market colchicine for gout and a few other indications. I’ve got to say though, colchicine isn’t a drug I’d ever want to take, and it has to do with its mechanism of action and narrow therapeutic window. 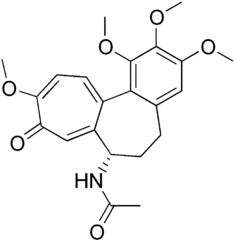 Colchicine has two modes of action in the body. In the first, colchicine inhibits neutrophil activity. These are a type of white blood cell that kicks into gear during an immune response, causing inflammation. In an inflammatory condition like gout, one could see how this could be useful. The second mode of action is by binding to tubulin, which in turn inhibits mitosis. Mitosis is important, and definitely not underrated. Mitosis is the process in the cell cycle in which the chromosomes are split into two identical daughter cells. We need mitosis for growth and replacement. It’s even what enables starfish to regrow limbs. The part that scares me most about colchicine is its narrow therapeutic window. That’s the difference in the amount of drug needed to do good and the amount needed to do bad. So while behaving as an anti inflammatory is a good thing if needed, inhibiting mitosis is bad, and here’s why. Our body is full of cells. All types, shapes, sizes, and functions. Some cells though, are replicated pretty quickly, and depend upon mitosis for replacement. Examples of these types of cells are our hair follicles, bone marrow, and the lining of the gastrointestinal tract. While therapeutic doses are around 2 mg, signs of toxicity can manifest in as little as 2 mg. Fatalities have been reported in doses as small as 7 mg.
Clinical features of colchicine toxicity has been categorized into three stages (1). Stage one is the GI phase, in which the lining of the GI tract is unable to replace itself, and nausea, vomiting and diarrhea start. The onset of GI distress starts a few hours after a toxic amount is ingested. The second stage is characterized by multi-organ failure. The patient, hopefully hospitalized, is under respiratory distress and experiencing kidney and liver failure. Death is most common at this stage due to cardiac arrhythmia or cardiac arrest. The third stage, recovery, is a joyous occasion because the patient will most likely survive, and is rewarded with the loss of their hair. If all of this sounds familiar, like chemotherapy, you’d be right. Many cancer drugs, like taxol, work in the same way, with the same clinical features. You are literally destroying every fast growing cell in your body. There is a small movement that wants to use colchicine as a natural anti-cancer drug, and while I applaud them for wanting to stay green and organic, there are better treatment courses available. Some may say I’m wont to hyperbolize, but it really can be a dangerous plant and poison. Case in point: A 62 year old male mistook autumn crocus for wild garlic and picked some for a salad. He and his wife ate the salad, his wife less so because of the bitter taste. After several hours they both had abdominal pains and he made his way to the hospital. He experienced diarrhea (stage 1), but was generally doing well. Enter stage 2. Over the next two days his liver and kidney enzymes were through the roof, a clear sign of multi-organ failure. He was sent to the ICU, placed on a ventilator, and eventually died of heart failure (2). His wife, who consumed much less of the autumn crocus, recovered from stage 1 in a few days. This is not a rare occurrence, as there are many case reports in the scientific and medical literature. But the danger of the autumn crocus (or meadow saffron) is not just restricted to humans. Grazing animals, such as cows, are also susceptible to colchicine poisoning. 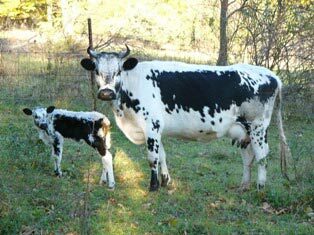 In one report (3), a herd of Randall heifers (cows, I Googled it) broke into a meadow and grazed away. One of the cows experienced severe GI distress, accompanied by bloody diarrhea (stage 1). The cow was treated with activated charcoal (to absorb drugs) and intravenous fluids. The urine showed signs of liver and kidney failure (stage 2), and died after the third day. The meadow was investigated, and there was evidence of grazing upon Colchicum autumnale. Colchicine was detected in both blood and urine, and I’m sure the case was signed out as an accidental poisoning due to colchicine toxicity. Maybe I can start a career in postmortem barnyard toxicology. The take home message is simple. Don’t eat anything that you are not 100% certain about, no matter how pretty they are. I have enough work to do and don’t need any “urban foraging” cases. It is also a reminder to know what you are planting and to make sure young children are aware of any dangers. The squirrels, they are on their own. 1. Finkelstein, Yaron, Steven E. Aks, Janine R. Hutson, David N. Juurlink, Patricia Nguyen, Gal Dubnov-Raz, Uri Pollak, Gideon Koren, and Yedidia Bentur. “Colchicine Poisoning: The Dark Side of an Ancient Drug.” Clinical Toxicology 48.5 (2010): 407-14. 2. Sundov, Zeljko, Zeljko Nincevic, Marija Definis-Gojanovic, Merica Glavina-Durdov, Ivana Jukic, Nada Hulina, and Ante Tonkic. “Fatal Colchicine Poisoning by Accidental Ingestion of Meadow Saffron-case Report.” Forensic Science International 149.2-3 (2005): 253-56. 3. Kupper, J., K. Rentsch, A. Mittelholzer, R. Artho, S. Meyer, H. Kupferschmidt, and H. Naegeli. “A Fatal Case of Autumn Crocus (Colchicum Autumnale) Poisoning in a Heifer: Confirmation by Mass-Spectrometric Colchicine Detection.” Journal of Veterinary Diagnostic Investigation 22.1 (2010): 119-22. Tags: colchicine, crocus, poison. Bookmark the permalink. Hello Mr Brower, Pity you didn’t add comment about Colchicine’s other trick in it’s arsenal – abilty to alter the ploidy of other plants, now to me that seems counter intuitive considering it’s inhibition of mitosis, splinters in the fingers – again. I only came across your articles today and have now spelt all day devouring – as an aged (UK) geek I have the time, not come across yet your pugnacious writing on Cicutoxin which is pretty evil and interestingly weird – might float your boat! Thabk you for all the articles Mr Brower, I am quite envious that you can work in what is also a hobby and be very articulate and at the same time comprehensible, that is a great talent. What’s keeping me from water hemlock (cicutoxin) right now is a photo – I like photography and including my own photos when I can. It grows all around me, but I just haven’t stumbled across it at the right time. Just to stress the dangers associated with meadows saffron. Yesterday, two elderly people, husband and wife, living not far from Venice died some days after dressing their rice with autumn crocus. They had gone promenading in the Alps and probably confused it with saffron: rice with yellow saffron is popular in northern Italy. Diagnosis was confirmed by necropsy and toxicological exams. Wow, that’s surprising! Thanks for the tip.